Last Sunday’s Fear The Walking Dead opened not with a zombie attack, a gun battle or Nick throwing up another cactus….but a happy wedding, starring none of the show’s characters. Most viewers might be forgiven for thinking AMC was running a Queen of the South episode by mistake, especially since very few viewers know what a Queen of the South episode looks like. Oops….that’s on USA, not AMC. I’m getting repetitious ads from two networks mixed up. I’m writing this at 1:53 AM, what do you want? All is going well until the groom, just seconds ago frolicking with his blushing bride, drops dead. I really had no idea why until I looked online after the episode aired; the implication was supposed to be that he had a heart attack. As his bride is giving him mouth-to-mouth, he turns faster than any body has turned in this series to date, and gives her the Frenching of her nightmares. What’s the importance of any of this? We find out in a bit. For now just remember who the woman in the back of the room is, because you’ll need to know later. And now, for the first time since the finale of Season 2A, it’s Travis and Chris! How are they doing? Not too good, but so much better than Nick. The water is running low and Travis has a bum leg, so they need to find better transportation to scavenge with. As fortune would have it they run across an abandoned car, so Travis gets to work hotwiring it while Chris checks out the gas station it’s sitting near. Chris finds some stuff, but he also runs into several Walkers, and after he’s dispatched of them, three people come out who were already plundering the place. He’s got the stuff they already called dibs on! Well, too late. Chris splits, yells at Travis to start the car, and they drive off. Travis and Chris drive the car until it runs out of gas, and then find an open field to camp in for the night. Unfortunately those other guys decided to follow them. 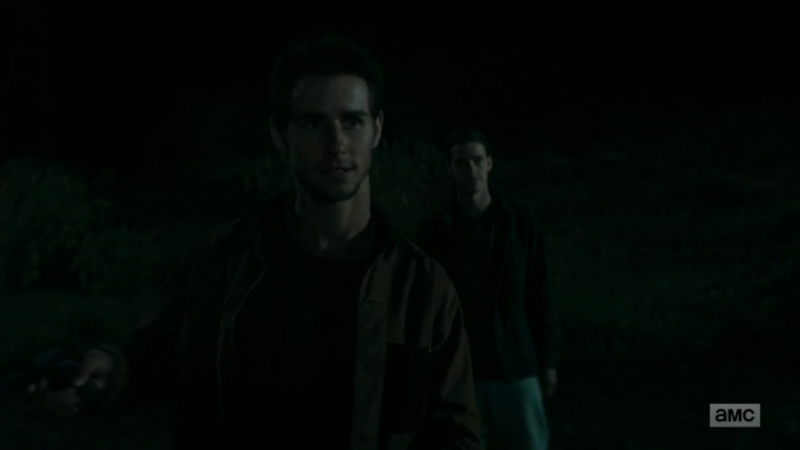 Chris quickly stomps the fire out and drags Travis into the bushes, but they already spotted the light. And 99 times out of 100, whenever you meet a stranger on a Walking Dead show, he’s going to kill you, especially when you already stole from him. What will they do NOW? Turns out, for once, all is cool. The people following them are three stereotypical dude-bro jocks who thought Chris’s one-handed knife tricks against the Walkers at the station was wicked awesome, man! They introduce themselves as Derek, Baby James, and Ryan Lochte. They’re stranded tourists, and Travis and Chris are also the only Americans they’ve met so far while wandering Mexico. They offer Travis and Chris a ride to the next town, which….having no car, they have to take. Chris is thrilled to meet more people his age, and bonds with them instantly. Travis, stuck in the back of their pickup truck, doesn’t appear quite as happy. 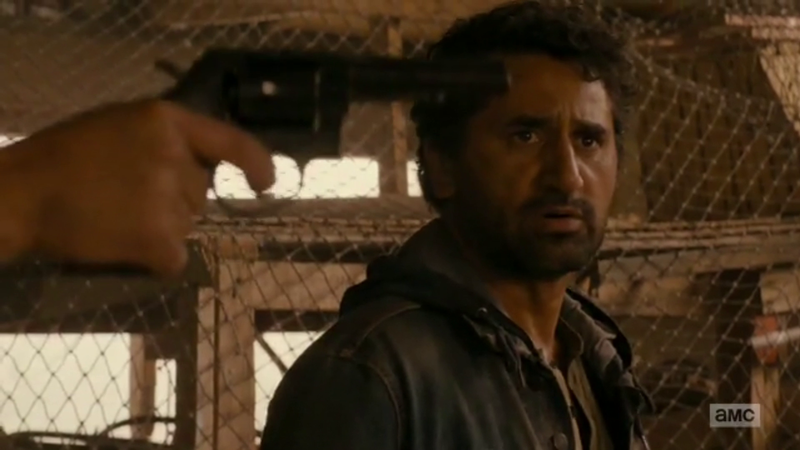 The Bro Brigade brags that the zombie apocalypse is the best thing that ever happened to them. Where they were originally viewed as directionless slackers, now they are “gods.” They do whatever they want, go wherever they want and take whatever they want. And they make a pit stop at an empty house to take some more. What they don’t check is if anybody is still living in there, ’cause who’s got time for lame stuff like that, bro? There is indeed a man still there, and he has a rifle. When the boys wander into his chicken coop to “nab some protein,” he comes charging in and orders them to leave. The bros raise their own guns, and Travis cautions them to think about this. That’s when Chris raises his OWN gun and shoots first! Right in the forehead. It would be an interesting twist if Chris turned into an actual villain. They’ve hinted at an evil streak of his before, but never this blatantly. I say they should go for it and not try to wimply buy this moment back. 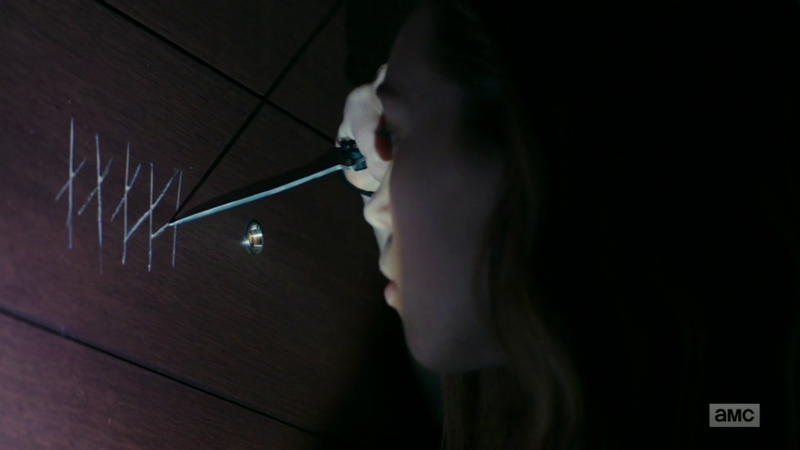 Meanwhile, Alicia is several floors up, alone and boxed in with only a butterfly knife for protection. She keeps a watchful eye on the door spyhole, marking a tally of every Infected that walks by and waiting for a gap in the procession. Just when she thinks it’s safe to open the door…JUMP SCARE! Three minutes of commercials! When we next see Alicia she’s found her break and out of the room. It takes around twenty seconds for her to get boxed in between two advancing armies, though, and the only doorway is an elevator shaft. 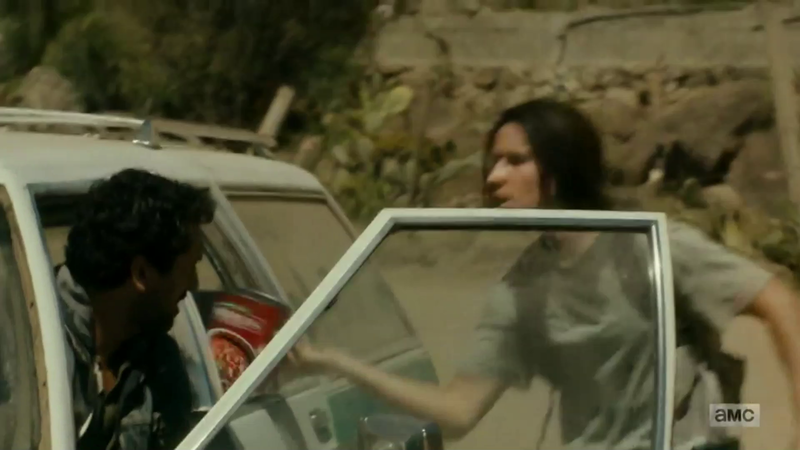 This might have been the end of her, if not for….OFELIA? No, not quite, that hand belongs to….Elena, someone you’ve never heard of. Remember the woman in the back of the room from the opener? This is why I told you to remember. And she’s not alone either! There’s an entire community of guests living upstairs, surviving off the food stores that are left and fending off the undead. Elena’s just down here because they hate her. Elena insists they’re trapped, but Alicia absolutely HAS to get down and rescue her mother, so she eventually talks Elena into rigging up a plan. Alicia confronts the zombies in the hall and makes noise, drawing them into one room. Elena sneaks into the adjacent room while Alicia lures them all toward the balcony, then slams the glass doors. And as she stands there nervously watching the horde slam against the glass while it starts to shatter, you have to wonder what kind of plan this is. It becomes clear when Elena appears on the adjacent balcony with some tied sheets as a rope. Alicia makes it across to the other balcony just as the zombies break through the glass. Guess that’s over, right? ….oh yeah, the whole mom thing. When Alicia and Elena get downstairs, they find the door to the bar barricaded and full of zombies. But that’s not the immediate danger….some of the other tenants are waiting for them, holding a knife to some guy’s throat. This is Hector, Elena’s nephew, and they’re ransoming his life for the hotel keys (that Elena happens to have). Elena sees no choice but to make the trade, but Alicia sees a Plan B and goes for it. She throws open some barricaded doors and a stream of zombies flood in, allowing the good guys to escape in the chaos. Alicia fears the worst about her mom, and then she watches in horror as a stray zombie with blonde hair slowly turns her direction…..
It’s not Madison, but it had me hoping for a second. That would have been quite a bomb to drop. Then the rush of that shock would have been diluted by the realization that the entire show would now be carried by the teenagers. Never mind, we need Madison. But where is she really? Elena, Alicia and Hector run from the undead they just let loose, and wind up cornered in the cellar. Their only way out is now a door that won’t open, and Alicia pounds on it, hoping against hope that Madison is somehow on the other side. Guess what — Madison was on the other side. Awfully convenient, isn’t it? And how did she and Strand get out of that predicament anyway? They saved those answers for the next episode.